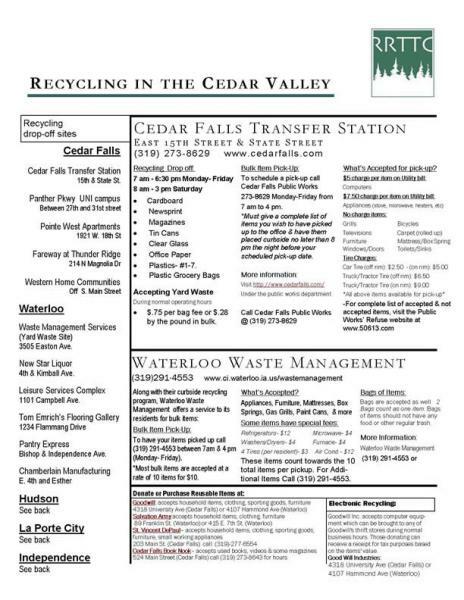 View the recycling drop-off sites located in the Cedar Valley. Visit the following websites for more information about waste management, recycling programs, and local food and farmers markets. The Healthy Cedar Valley Coalition is a group of community organizations and individuals who come together to enhance the health of the Cedar Valley through education, outreach, and advocacy. This group's main goal is to create a healthier community for current, and future generations through fresh produce availability, health and well-being, and also sustainability. The residents of Cedar Falls wanted a way for their curbside recyclable waste to be properly disposed. They came up with an organization called Recycle Rite, whose mission is to provide effective environmental service solutions to the Cedar Valley. The Black Hawk County Sold Waste Commission owns and operates all aspects of the Black Hawk County Landfill. They are a dedicated organization that provides safe and effective ways to manage solid waste, while also protecting natural resources in Black Hawk County. Visit the Cedar Falls Farmers Market to enjoy fresh produce and other items that are locally grown, baked, or made. The farmers market is open Saturday mornings 8:30am-12:00pm. The market begins the first weekend in May and continues until the last Saturday in October! Check out our Facebook page here. The College Hill Farmers Market is another great market providing fresh produce and organic alternatives grown locally in the Cedar Valley. Their hours are 4:00-6:00pm, every Thursday during the months of June-October. The Cedar Falls Food Co-op focuses on locally grown, healthy, and organic produce. They are striving to create a full-service food cooperative in, or near Cedar Falls to serve and feed the Cedar Valley community.